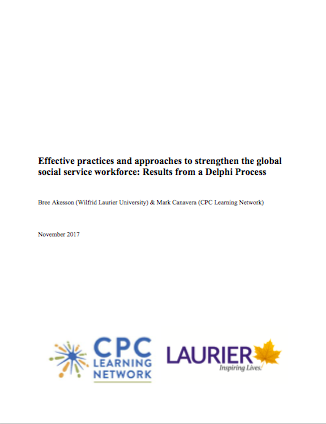 A Delphi review by faculty affiliate Bree Akesson of Wilfrid Laurier University and CPC associate director Mark Canavera, sought to identify ways that the social service workforce can be strengthened around the globe. 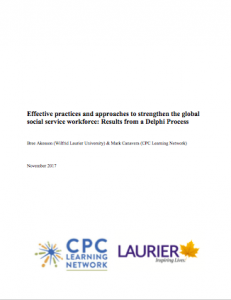 This work was undertaken on behalf of the Building the Evidence Interest Group of the Global Social Service Workforce Alliance. The data identified a broad array of challenges to the creation of universally applicable practices aimed at workforce strengthening. Issues of contextualization, resource availability, and access to quality training are several factors complicating the identification of global social service work practices. It is important that future research on this topic consider voices from low- and middle-income countries and continue to add to the evidence base on this topic.